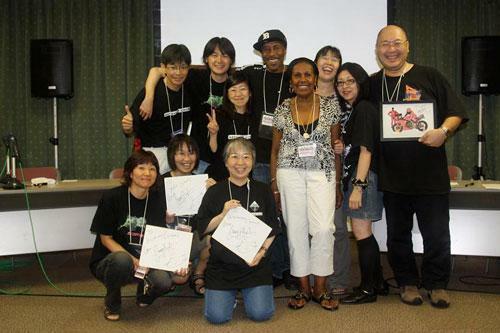 When the call came with an invite from ‘The J Team’ to attend the science fiction convention, ‘Tokon 10’ to present the showing of ‘Back To Earth’ with Japanese subtitles, my bag was packed before the end of the call. You see my four-year-old son has got into the habit of charging into our bedroom at six in the morning and trying out for the trampoline team using our bed and what generally feels like our brittle bones for bounce. This trip was my way to get a little break away from this nightmare I call, ‘The Land Of My Rising Son’. ‘The J Team’ is the Japanese Red Dwarf Sci-fi community. I fondly named them that after my last trip to Japan. They are a posse of brain boxes who get things done thoroughly, and boy was my trip organized. These guys give you an itinerary just to go to lunch. 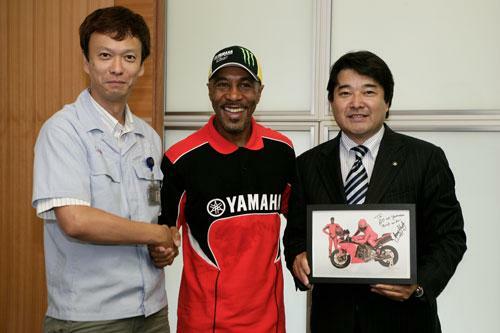 Red Dwarf has been shown in Japan for years and the pink themed Cat Bike had caught the imagination of the powers that be at Arai and Yamaha. Arrangements had been made for me to visit both companies during my visit. WHAT?!! When they were last in London my Mum made the J Team a traditional Caribbean dinner and got them pissed on white rum so they invited her too! I think they thought it was Saki. CAMPAI!! On the plane we met Morten Harket form the 80’s group ‘Aha’. There was a big music festival going on in Tokyo and Osaka and this is their last tour. The man still looks like the Nordic Adonis that appealed to all those screaming girls, Mums and Grannies back then. My Mums eyes were watering but I wasn’t sure if it was him or the champagne she was sipping. I knew the girl that starred in his groundbreaking video where animation and film were intertwined. We knew each other from the dance circuit. They became an item. The song was called ‘Take On Me’ and she did. He invited us to his Tokyo gig but unfortunately it landed on the same day as our convention. My Mum was inconsolable. Arriving in Tokyo, ‘The Land Of The Rising Sun’ certainly lived up to its name. It was boiling hot, more so than the legendary battles of Rossi versus Biaggi, Gibernau and Stoner, but instead of hostility, you could cut slices of humidity right out of the air. Our host Mr Yasuyuki Torii took us directly to our hotel for a ‘pit stop’ and then it was down onto the immaculately clean metro system. (They even have drinking water fountains on the platforms) Our first appointment was with Arai. On arrival my first thought was that their building didn’t look, as high tech as I had imagined, but once inside, there was legacy in abundance. We were introduced to the staff by Mr Hiro Kimura, Mr Arai’s right hand man and trusted advisor who had been at the company for thirty years. We were ushered into the governor’s office where I noticed a photo of a man with a Fez, sitting on a camel at the pyramids of Giza, just like the one in MCN of Graham Hoskins and me on our endurance ride around the Med. It turned out to be the man who founded the company in 1926, Mr Hirotake Arai. This guy was a hat maker, he used to make firemen and construction helmets and only made a crash helmet for himself after originally wearing a Shoei! His son, Mr Michio ‘Mitch’ Arai, the current President entered with his son, Akihito. He was cool; he didn’t need an interpreter, a boss who wasn’t scared to get his hands dirty. His wife brought in tea and we chatted about the company. I presented Mitch with a framed photo of the pink themed bike and he gave my helmet his seal of approval, which, after some of the very humorous stick I’ve had, was better than all the gifts I got from them. Mr Kimura showed us around three different buildings representing three different stages of production. 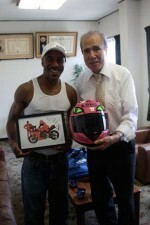 He assured me that no one before me had been privy to a demonstration of the testing of the Arai helmet. I saw famous F1 lids belonging to the likes of Lewis Hamilton and Mark Webber and even got to sign the same visitors wall along side people like Randy ‘The Mole’ Mamola. (Well, that’s what I call him) The eureka moment for me though was seeing that at the first stage of production, all Arai helmets are pink! We had been there for about three hours, so we said our thanks and goodbyes. In true Japanese fashion, everyone stood up, bowed, Sayonara’d and after I left probably said, (just like everybody does) “he looks a lot taller on TV”. 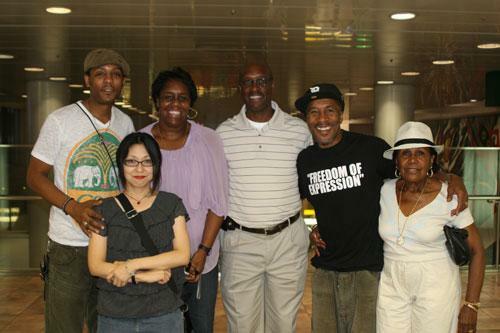 I met up with my cousin Daisy who lives on one of the US bases with her husband and Jeffrey Daniel from the legendary group ‘Shalamar’. He brought the ‘Back Slide’ to the world and taught it to Michael Jackson who named it the ‘Moonwalk’. He choreographed many of MJ’s videos, even giving Wesley Snipes his first gig in the ‘Bad’ video. I worked with him in Starlight Express in 84. 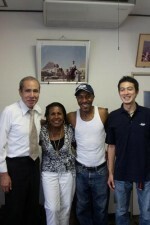 He’s been in Japan for twenty years. I hadn’t seen either of them for twenty-five years; it was like a reminiscing fest. We visited the Meiji Jingu (Shrine) where we witnessed a traditional Japanese wedding. We then went to a cinema like no other I’d seen. It was like a club. The seats were better than the business class Recaros that we flew over in. There was a lounge with DJ, piano, waiters, etc. Japan at it’s best. We then headed back to the hotel for drinks. 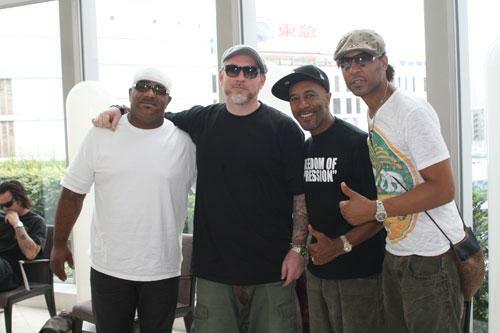 There we bumped into Everlast from ‘House Of Pain’ the man responsible for ‘Jump Around’, the 90’s club anthem and Gary ‘Mani’ Mounfield from The Stone Roses/Primal scream, representing Manchester, the city that bore Ryan Giggs, The Hacienda and Red Dwarf. It was fascinating watching Jeff and Daisy negotiate their way around Japan, speaking the language, showing us how not to embarrass ourselves and watching the respect they had garnered over the years. They both seemed to be welcomed as, ‘one of them’. It was a great day and I was sad to see them go, but alas, we had a big day ahead of us. Feeling like I had just ridden a sixty lap GP in the rain with Rossi on my tail, I fell into bed. The next morning I was awoken by my son performing a full twisting, triple Gaynor with an inverted Gienger summersault and landing it perfectly onto my groin. Screaming in agony, I realised that it was all in my alcohol filled mind. It was my bladder alarm. Proud as a peacock, I headed for the bathroom. My clock showed that our host would be arriving in an hour. After a very British, ‘S S & S’, and before you could say Ben Spies, we were off to Yamaha. The Bullet train was amazing. Like their bikes these things were fast and smooth. It arrived and departed exactly when they said it would. Numeric markings on the platform let you know where to stand so that you entered the train by the door nearest to your seat. The staff all wore beige uniforms with white gloves. A girl, immaculately turned out came through the carriage with a trolley laden with refreshments. She looked better than the flight attendants on our plane, and they were lovely. I’m dreading my next journey on our national railways. 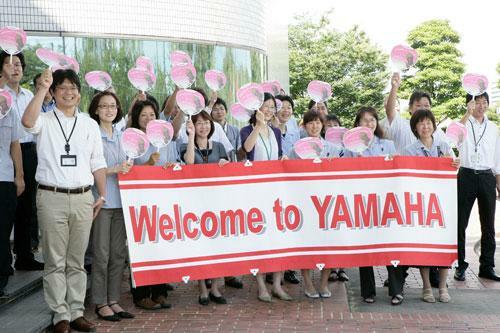 To say that the welcome at Yamaha HQ was mind blowing is an understatement. 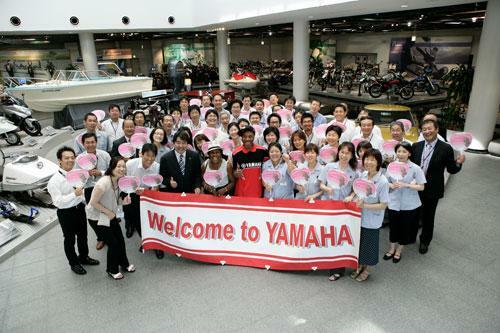 The whole of the staff were outside with a massive pink banner saying ‘Welcome To Yamaha’. There were three professional photographers led by Mr Hideto Kobayashi. They were even wearing pink Polo shirts. 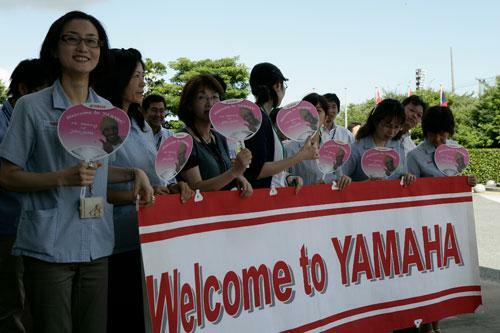 Everyone was waving pink Yamaha fans with my face on baring another welcome message. I was introduced to the General Manager Mr Takahiro Fugimura, and Manager, Mr Toshiya Kawano who was integral in organizing my visit. Their enthusiasm was only matched by the research they had obviously done on my career and the somewhat flamboyant antics I had been engaging in at TT, Moto GP, in MCN and the motorcycle industry in general. 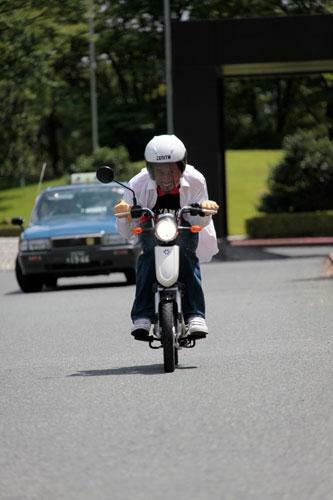 I wondered if they were just making sure they outdid Arai…. Nah! Imagine, I’ve been in three award winning BBC shows and I’ve never been invited there for so much as a cup of tea. This was real recognition. 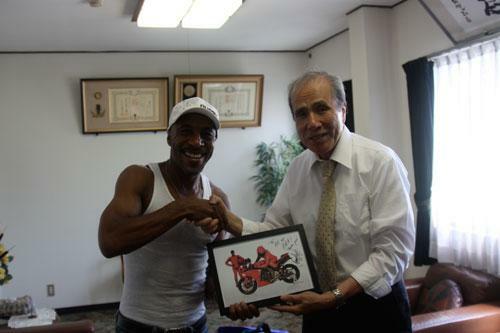 I presented them with a signed framed photo of the pink bike and after signing autographs for the staff and having taking an ‘official’ photograph, Mr Fugimura invited us to the boardroom. He gave me the obligatory itinerary for my day at Yamaha and I was told about what the company was up to and I did the same in turn. I was handed a Yamaha goody bag that contained among other things the latest of their products, Anti-aging tablets! I kid you not. What was he saying? I was then introduced to the Senior Engineer, Mr Toyoshi Nishida who is responsible for the development of the R1. I’d love to comment further but I was sworn to secrecy. 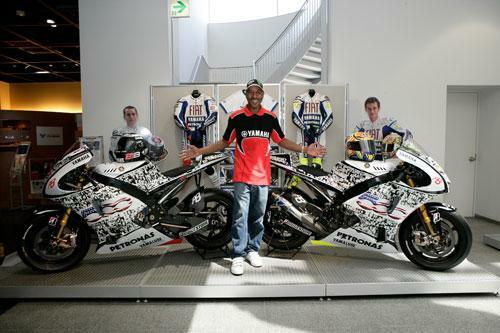 I was shown around the Yamaha Museum, where I was left in the hands of Mr Tiachi Ito, the Manager. He showed me everything from pianos, jet skis, bicycles, electric and normal, snow mobiles, speed boats, golf buggies, catamarans, cars, F1 cars, car engines designed for other manufacturers and outboard motors that were taller than me. Things on show went from the original 1930’s products right up to the latest. 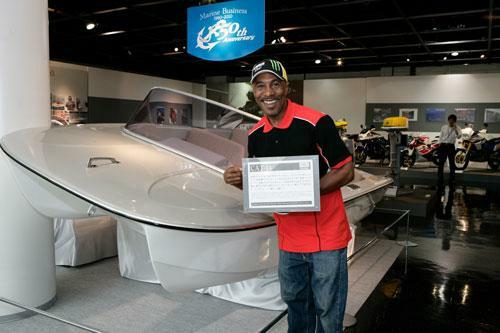 I did 200mph on a bike and even caught a swordfish. Alas both events happened on simulators. There is even a plane powered by pedals hanging from the ceiling. Imagine, all this from a man who started making wooden plane propellers. There was every bike you could imagine, from the original to drawing board, from road to track… except one, the bike that was the influence for my pink bike. ‘The Thundercat’. I was horrified and I think Mr Ito was too. I had forgotten that you didn’t show those kind of emotions, which was excruciatingly painful as I know that Steve keys, who co-ordinated the pink bike for me, had recently sold an original Thundercat in pristine condition with about three miles on the clock. Needless to say, someone is in the process of making the purchaser an offer he can’t refuse. As a consolation I was allowed to sit on Rossi’s bike that he rode in America, it was flown there directly after the GP together with Lorenzo’s. I did find one thing weird, I never saw a race bike never mind an R1 on the roads during my stay. I only saw Harleys or scooters. I was then taken outside where an electric scooter was waiting for me to test ride. Me? This product isn’t going to be in Europe until 2011 and I was assured that no one outside of Japan had ridden one. It was amazing. I was like a kid in a sweetshop at midnight. This thing was agile, nippy and had more kick than I was expecting. I’ve ordered one in pink. “Here’s to The Land Of The Rising Sun”. I would like to dedicate this article to Shoya Tomizawa (RIP) a true Shogun Warrior of the track.